Discussion in 'Airheads' started by Prutser, Jul 23, 2013. It's the same bike Dave, with the same subframe. The bottom picture shows a bit better what curves the tubes have. hotwheels22, Te Hopo, Stagehand and 3 others like this. The bike looks a lot better now with it's black rims. Made a picture with the frame mount. I welded plates onto the aluminum fender and these are bolted against the fenderbrackets which are available for this type of fork. I will show some pictures when the bike will be back in the shop next week. Real nice and practical solutions! How does the (original?) fender fit and is it applicable for the orginal seat lenght ( a loose mount TT-one seater with carrier)? The stock double seat will fit but the lock will be different. I didn't try the stock fender because I won't be using one. I never use the solo seats with luggage rack because it's heavier compared to the stock seat plus luggage on a rack wears a lot faster than when tied onto a seat. It wouldn't be hard to make the solo seat and rack work if I ever change my mind. I'm going to use 1998 RM250 closed cartridge forks. apologies for the late reply to the front end bit, but are those triple clamps from the RM or something you cleverly devised? easy to fit to the head tube? The ones I used are my own custom triples. The RM ones will fit too but will have less steering lock. Wow, JUST now noticed the custom oil coolers. Super cool, want! 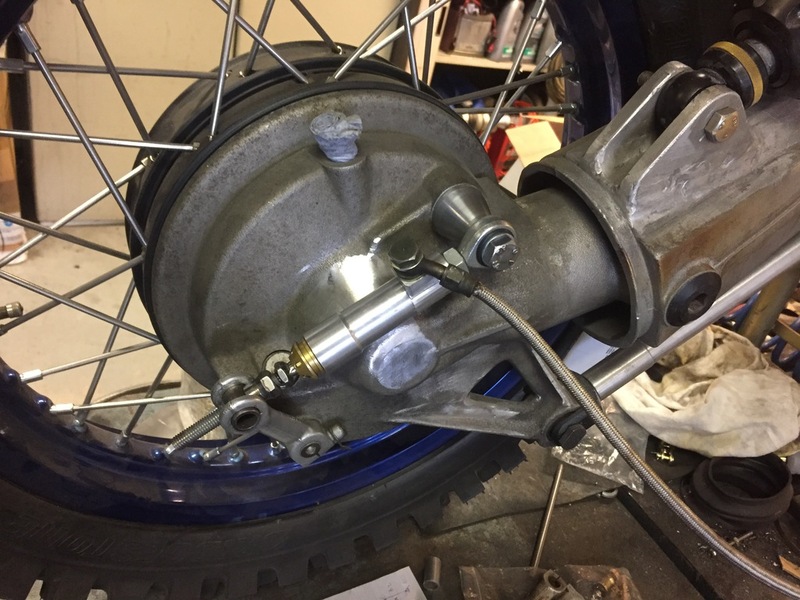 We have done some more testing with the hydraulic rear brake. The first time I had a 14mm master cilinder with a 12mm slave cilinder. With that I needed to push way to hard to lock up the wheel. Later I used a 13mm mc still with the 12mm slave cilinder which was a lot better but still not good enough. The bike in the picture needed to ride asap so I used Dmaster's set up from his BMWsaberg project. He had made a 14mm slave cilinder with a 12mm master cilinder. In the end we used my prototype 12mm slave cilinder together with a 12mm master cilinder which performed really nice. Still need to test in on a fully loaded bike with some decent road tires but it does feel like a perfect match. Stagehand, Te Hopo, pietas and 13 others like this. Prutser, is this still the same bike from the previous pictures? 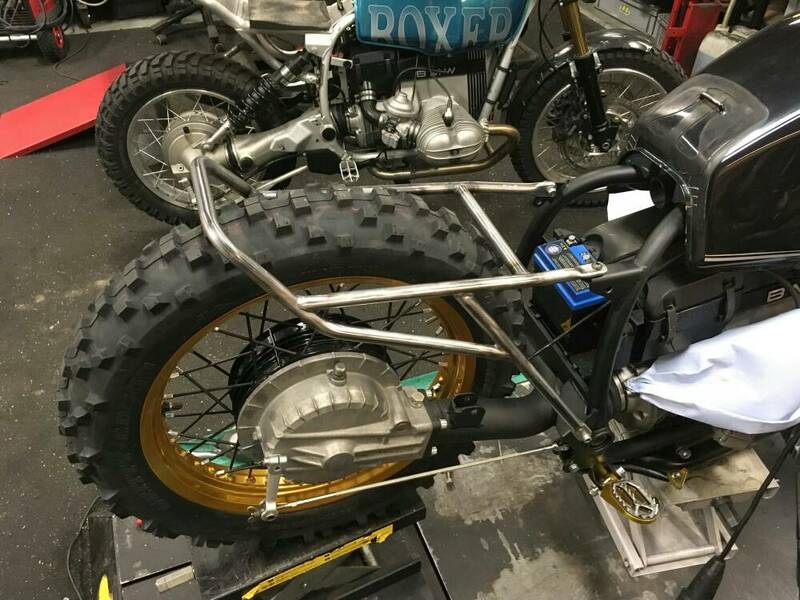 Looks like a former paralever bike still - but a different master cylinder placement now. *edit - never mind. I see it is a different bike now. But I'm interested to know if you have a preference for the location of the master cylinder. The R100GS frame on the bike above was reinforced so they already fitted a mastercilinder from an CRF450. Personally I prefer a mastercilinder with a reservoir mounted higher. So it is a different bike indeed but the same slave cilinder. Until now I have only been able to mount a mastercilinder on the GS frames which was easy. Fitting one on a G/S frame might have to wait until the winter when I have more time for these sort of projects. Exactly the information I searched for. Thank you!! I'm waiting for the info of when it will be available as a straight bolt-on for a Paralever GS (actually R100R) and price delivered to Texas, USA. I think this will eventually be an essential for those of us with mono & Para bikes with rear drums. It certainly seems a better plan than adapting a R1100 disc Paralever just for the brake. Indeed. In fact, the cable arrangement set up that I have, it was suggested that BMW Dakar guys went away from it because the whole cable and linkage gets gummed up with crud. I can see me getting two of these if they become available One as a spare. dazzadm, Uke and Jim Day like this. You've already got a free mounting point (shock mount) on your final drive, Jason - should be pretty straightforward I'd think. I could see one of these in my future too. Not that I particularly need one, the old brake has been acceptable enough for 200k km already, but damn it's a cool bit of airhead bling. Stagehand, Te Hopo, bleaknessengine and 2 others like this. When is preliminary R&D on the hydraulic clutch upgrade going to begin? Would like to ask you some questions, please. "less mud orientated bike" ? How much suspension travel does it have ? Do you sell this stuff ? Do you have a separate internet homepage. Have been working on a less mud orientated bike for a change. The Hydraulic clutch is Dmaster's project. He knows more about those parts. It's a Hyperpro 43mm fork. The amount of travel depends on the length you use. I don't have a homepage because these build I'm doing is just for fun not for business. If you would like to know more details about the fork please send me a PM. I was trying to be funny-- I should have known you guys were already working on one!